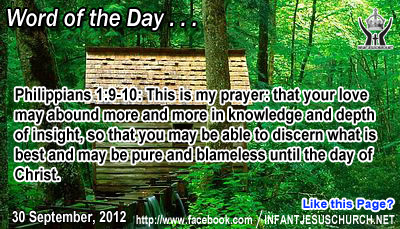 Philippians 1:9-10: This is my prayer: that your love may abound more and more in knowledge and depth of insight, so that you may be able to discern what is best and may be pure and blameless until the day of Christ. Heavenly Father, teach us your ways and give us your heart as we strive to not only love you, but to know your will and have insight into your ways. Help us to know the best things to do today and through the rest of our life. Give us wisdom to use our time in the best way possible to live out your will in our work, with our family, among our friends, and particularly before those who do not know Christ as their Savior. In the name of Infant Jesus, we pray. Amen. Today’s Gospel is Jesus exaggerating when he urged his followers to use severe measures to avoid evil and its harmful consequences? Jesus set before his disciples the one highest goal in life that is worth any give-up, and that goal is God himself and his will for our lives which leads to eternal peace and happiness. Just as a physician might remove a limb or some part of the body in order to protect the life of the whole body, so we must be ready to part with anything that causes us to sin and which leads to religious death. Jesus warns his disciples of the dreadful responsibility that they must set no uncertain block in the way of another, that is, not give offense or bad example that might lead another to sin. The Greek word for temptation is exactly the same as the English word scaandal. The original meaning of scandal is a trap or a hesitant block which causes one to trip and fall. The Jews held that it was an unpardonable sin to teach another to sin. If we teach another to sin, he in turn may educate still another, until a sequence of sin is set in motion with no predictable end. The young in faith are especially helpless to the bad example of those who should be passing on the faith. Do we set a good example for others to follow, especially the youth?